The Edison is a luxurious and affordable handmade nickel bath sink. This individually handcrafted sink is made with a luxurious hammered nickel finish. The bold and innovative design offers more than just a sink, it is a work of art for your home. Featuring a maintenance free finish and straightforward installation, a hammered nickel sink from Sinkology is intended for everyday living and offers a limited lifetime warranty. With its understated, straightforward design, Bryant complements both traditional and modern bathrooms. This Bryant sink is an attractive option for bathrooms with a classic, everyday appeal. Available in an array of KOHLER colors to match any bathroom decor. The minimalist approach of the Bryant Oval sink evokes casual elegance. Appealing and affordable, this versatile design is an ideal choice for both contemporary and traditional bathroom styles. Recalling the elegant simplicity of Shaker-style furniture, Tresham blends classic American design with a modern eclectic sensibility. This oval basin's raised rim helps keep water from splashing over the side and also adds a charming design accent. The Born copper sink by Sinkology is artfully handcrafted from pure solid copper. Naked pure copper sinks are maintenance free and will age naturally with use. These copper sinks can be polished to new anytime. With hassle free installation and effortless care, a copper sink from Sinkology is designed to fit your lifestyle and be a focal point of pride for your home. This naked copper sink features our Dual Flex rim making installation easy and flexible, can be used as an undermount or drop in. This true work of art comes with a limited lifetime warranty. Edison 18 1/2-inch Dual Mount Oval Bathroom Sink in Hammered Nickel The Edison is a luxurious and affordable handmade nickel bath sink. This individually handcrafted sink is made with a luxurious hammered nickel finish. The bold and innovative design offers more than just a sink, it is a work of art for your home. Featuring a maintenance free finish and straightforward installation, a hammered nickel sink from Sinkology is intended for everyday living and offers a limited lifetime warranty. 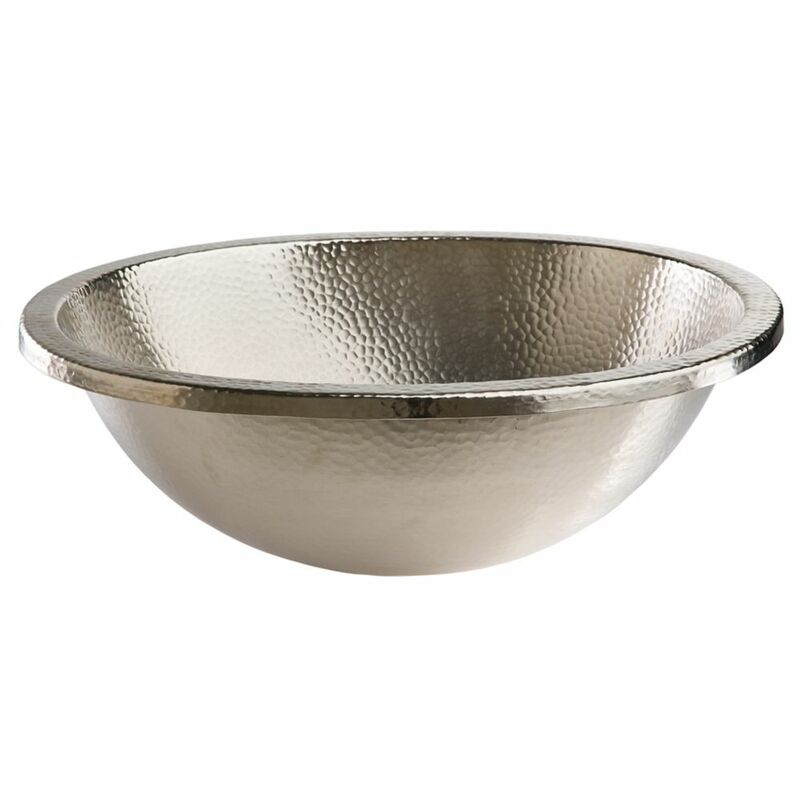 Edison 18 1/2-inch Dual Mount Oval Bathroom Sink in Hammered Nickel is rated 4.8 out of 5 by 5. Rated 5 out of 5 by Melissa from looks great! NO issues!... looks great! NO issues! Rated 5 out of 5 by kathywithakay from Very unique sink! We used this sink as an undermount and it was mounted by our countertop instal... Very unique sink! We used this sink as an undermount and it was mounted by our countertop installer. We were then able to easily hook it up to our plumbing. Note: We were going to use the drain that came with our faucet but it would not work with this sink. We had to order the Sinkology drain from Amazon. Rated 5 out of 5 by tmj from These sinks are beautiful and easy to install. They don't have any other attachments at all. It... These sinks are beautiful and easy to install. They don't have any other attachments at all. It's just the sink.